I absolutely love my Arlo wireless home security camera system, but I also recognize that not everyone wants to use such an expensive solution. Lucky for you, there’s a wire-free home camera that’s almost just as good as Arlo for about half the price. Actually, it’s even better than Arlo in one important way, since it offers 6-month battery life! 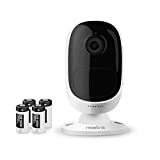 The Reolink Argus 100% Wire-Free Battery-Powered Security Camera can be used indoors, outdoors, or anywhere that’s in range of your Wi-Fi network, and it only costs $95 right now on Amazon. Definitely do yourself a favor and check it out. [100 % Wire-Free & Battery-Powered] No cords, no wiring & no installation needed — easily place it anywhere guarding every corner. Reliable 2.4Ghz WiFi connection. [1080p Full HD & Excellent Night Vision] Enable you to see everything clearly day and night. See sharper and clearer images/videos than 720p security cameras. [Easy Setup & IP65 Weatherproof] Small, protable and also weathproof! Easily place Reolink Argus outdoors/indoors without worrying about the weather. Rain or shine, hot or cold, Reolink Argus never stops protecting you. [Smart PIR Motion Sensor] Highly sensitive and wide-angle sensor detects human movements, and offers real-time and accurate alerts (app push notifications, emails, siren etc). With Micro SD card slot (max 64GB supported). [Remote View & Two-Way Talk] The built-in mic & speaker allow you to view & listen to what’s going on at your home/business and talk back with just a touch! IF THERE ARE ANY PROBLEMS, PLS contact us via Amazon, we will get back to you within 24 hours.